Some of the world’s biggest cities and most recognisable landmarks have been developed on reclaimed land. The most famous of these include The Polders in The Netherlands, Hong Kong’s Chek Lap Kok International Airport, Kansai International Airport in Japan, Cape Town’s foreshore as well as major parts of Singapore, Macau, Hong Kong, Monaco and Helsinki. The city of Rio de Janeiro is largely built on reclaimed land as are significant portions of Boston, Chicago and even Washington DC sited on reclaimed swamp land. Worldwide, the trend of creating new land—in the choicest and most strategic locations—reclamation continues to grow as a tried and tested method of increasing a growing city's liveable acreage. This has brought significant advancements in reclamation engineering and techniques and capabilities. The sand filling and soil treatment method (to address consolidation aspects) was used to create the first phase of Seri Tanjung Pinang (STP1). This method is also being adopted for the second phase of Seri Tanjung Pinang (STP2). This is one of the safest and most extensively used reclamation technology in the world, which is also adopted for the reclamation of Singapore’s Tuas Biomedical Park 2, the Disney Theme park and Chek Lap Kok International Airport in Hong Kong, the Betuweroute Railway in The Netherlands and Palm Jumeirah in Dubai. 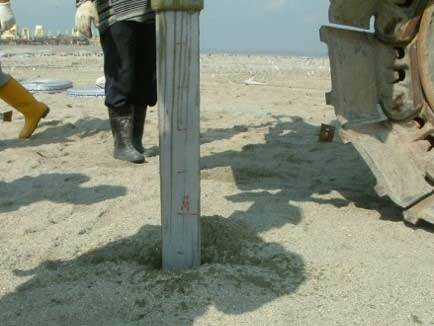 It is noteworthy that the STP2 reclaimed land will have a platform level that is raised to 5.5m-6.0m CD (chart datum). At 6.0m CD it is 2.8m above the highest astronomical tide (HAT) and more than 1.5m above the recorded wave height at Tanjung Tokong during the 26 December 2004 tsunami event. In comparison, the then partially-completed STP1 revetment wall (3.7m of the final 4.7m height) has proven able to withstand the tsunami. The platform level of STP1 reclamation work had already reached the final level of 5.0m CD. The STP2 reclamation platform and revetment system is therefore a significant enhancement in terms of wave protection. 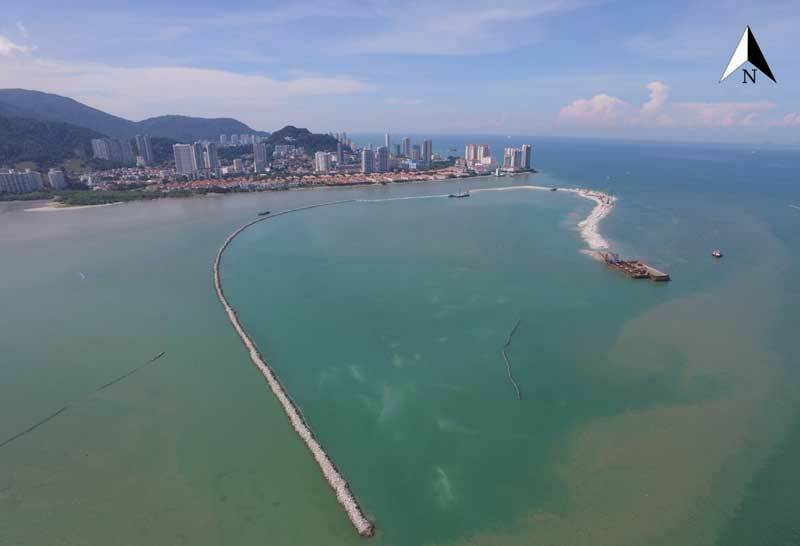 Furthermore, all newly-created STP2 shoreline fronting shallow waters (-3 to -4 m) will be protected by revetments, while all shoreline fronting deeper waters (-5 m) will be protected by stronger structures of sheet piles. The diagrams in the Technology section are for illustrative purposes only and are not actual detailed construction design drawings. during this process, both sand and seawater are pumped onto the site. The seawater subsequently drains away leaving only the cleaned sand behind. This essentially forms the reclaimed land. 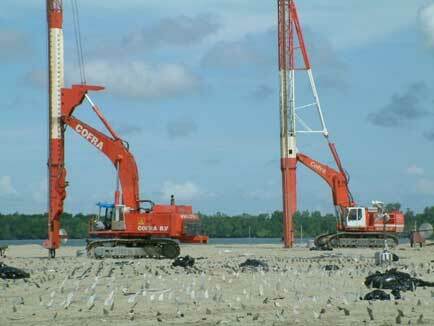 computing the stability of the reclamation and coastal protection works. 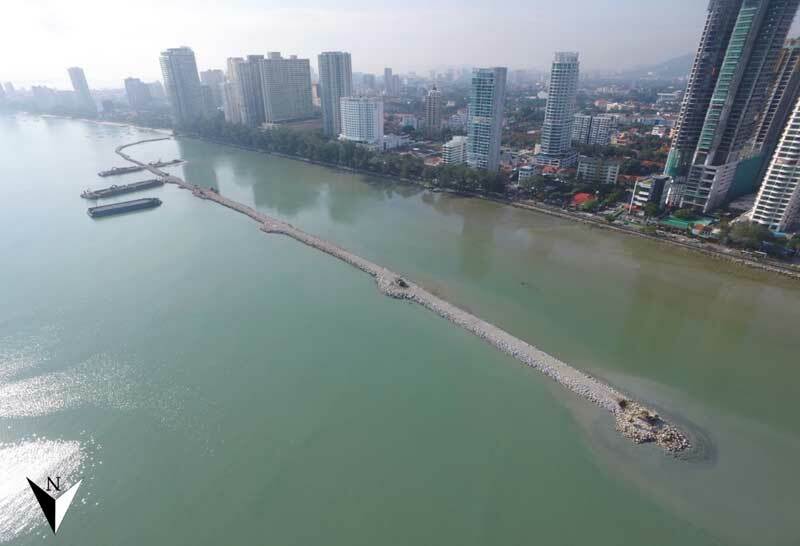 Part of the environmental requirement as a first initial stage of the construction is to provide a perimeter bund surrounding the proposed reclamation area. 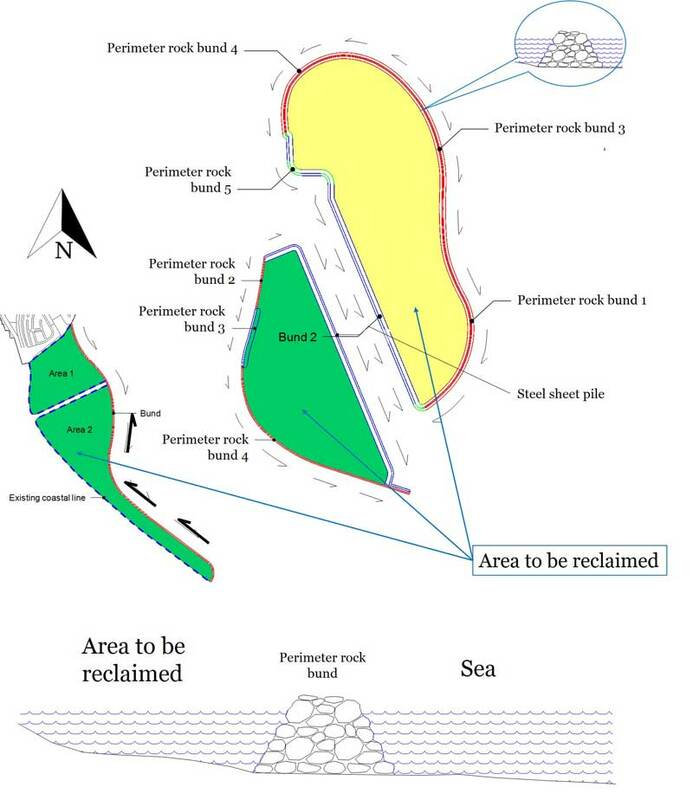 The perimeter of the reclaimed site is first determined and a rock bund (trapezoidal shaped gravity wall consisting of big rocks weighing ~ 115kg each) is constructed along this perimeter. 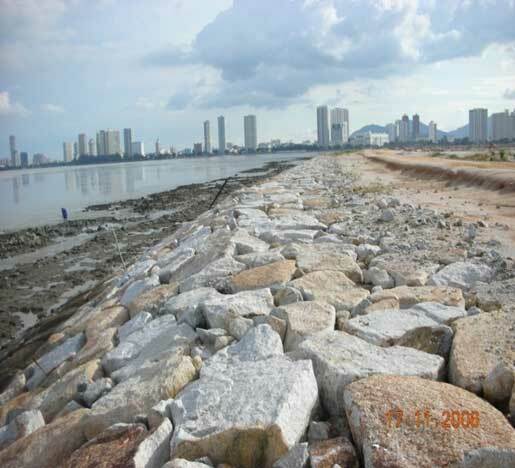 In the case of STP1, the armoured rock bund effectively withstood the tsunami waves of 26 December 2004. 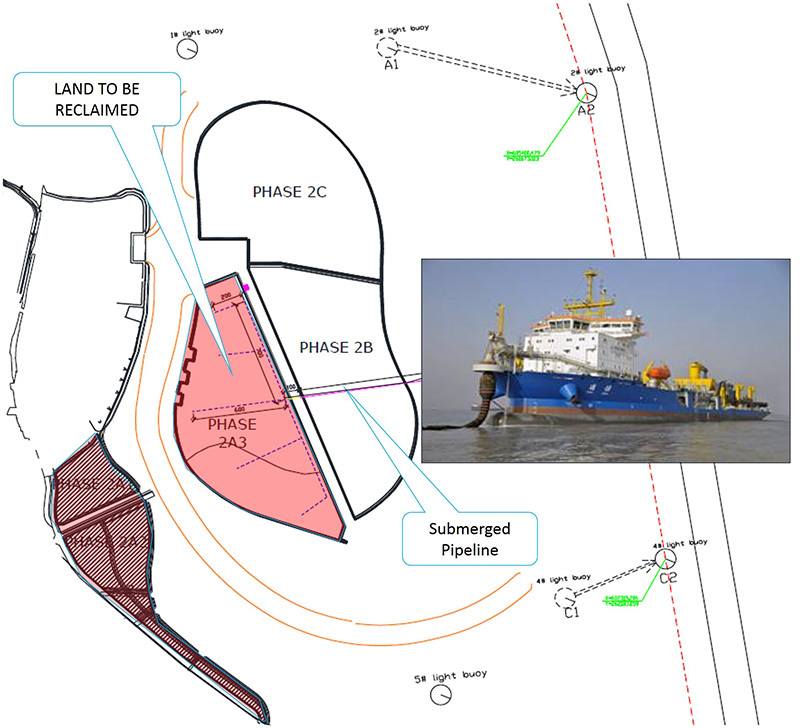 The next step is where sand, dredged (using a trailer suction hopper dredger) from an approved sand source location and transported to the site, is conveyored or pumped directly through submerged steel pipes onto the area to be reclaimed. 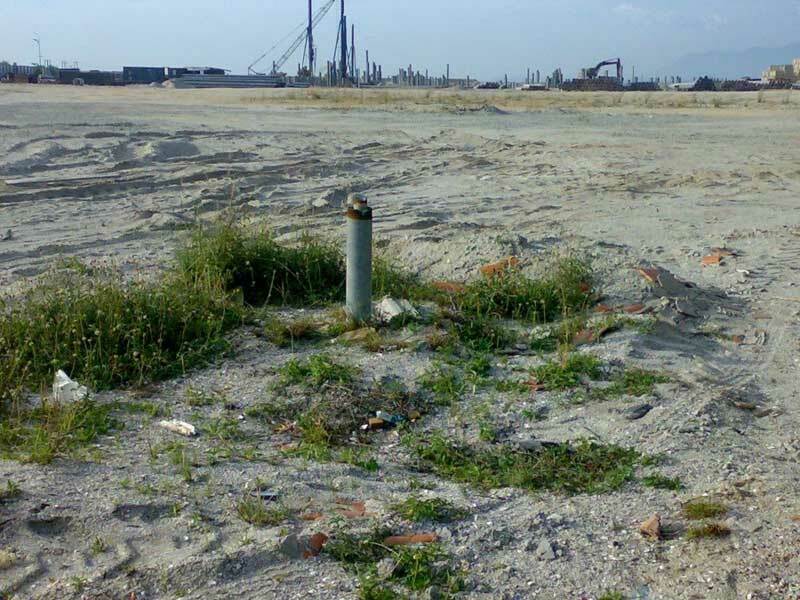 This part of the process involves the placement of a thick layer of earth or sand on the surface of the reclaimed land. The purpose of this is to use the weight of the surcharge to accelerate the compression of the clay layer. Clay material is naturally saturated with water. 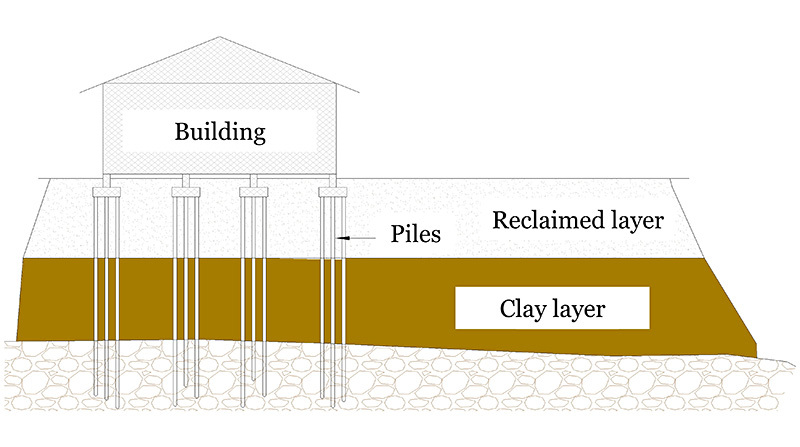 When clay is compressed, water is squeezed out and flows up and out onto the surface through the vertical drains. Surcharging the site usually takes 6-9 months. During this time, settlement readings are taken every 2 weeks and results are plotted on a graph. Upon reaching a period of 6 months or until the clay strata reaches the targeted magnitude, the surcharging will seize. The consolidation process requires 90% degree of consolidation to be achieved in order for the land to be safely used for future development. By closely monitoring the settlement readings, engineers are able to determine when the clay reaches the targeted settlement magnitude. 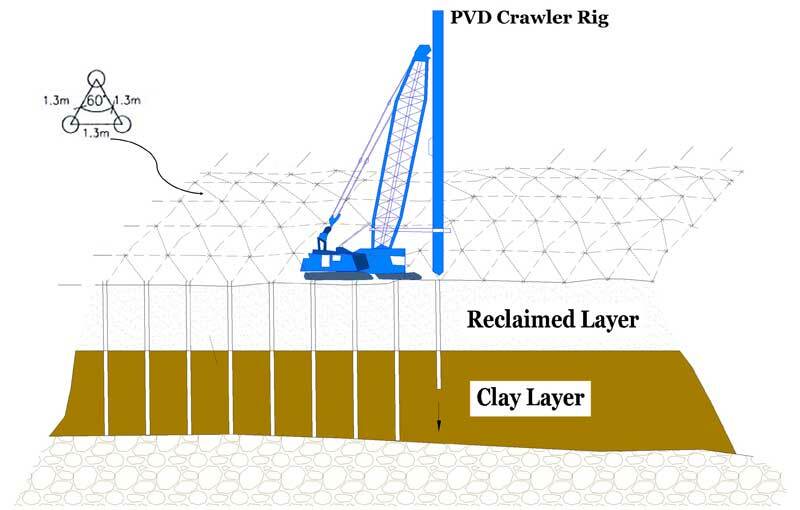 Once it is observed that site has fully settled, the surcharge layer is removed to the designed platform level. Once the clay strata has been surcharged and loses its water content, the clay material remains compressed and does not expand. The site is then ready for construction work to begin. 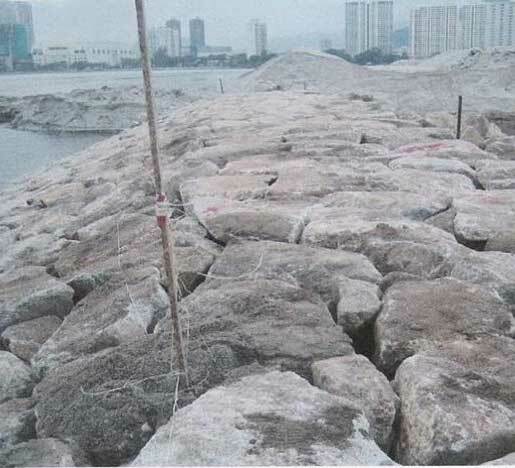 Concurrently during the reclamation works, the rock bund is further strengthened into a rock revetment wall which makes the structure even stronger and more efficient in absorbing the force of storm waves. The core layer (inner layer) of the revetment is made using the perimeter bund that was constructed earlier to contain the fill material in the early reclamation stage. 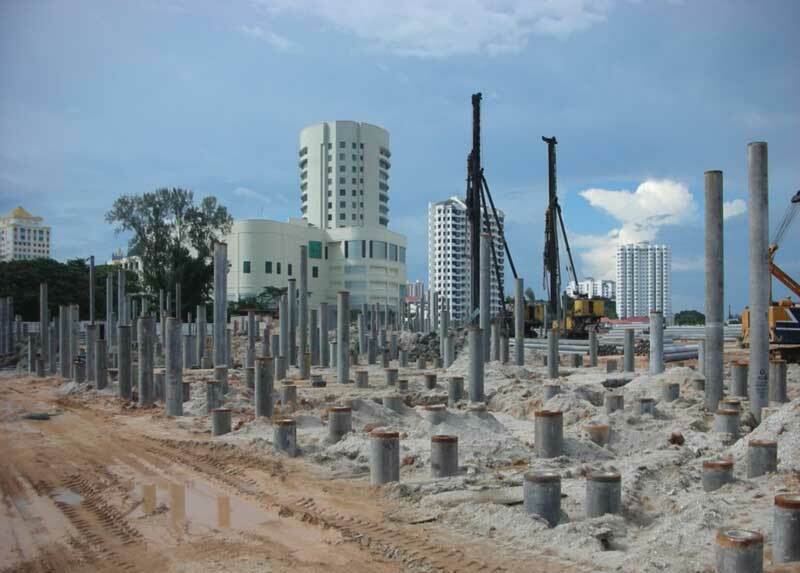 In addition to the extensive ground treatment (vertical drains and surcharge) on site, all homes and buildings in Seri Tanjung Pinang shall be founded on spun piles. Spun piles are steel reinforced concrete columns that are driven through the layers of sand and clay into the firm ground below, to support the load of buildings. Once the piles have achieved its set, it is ready to receive and transfer the weight of the buildings above. 2019 © Tanjung Pinang Development Sdn Bhd. All rights reserved. 2019 © Tanjung Pinang Development Sdn Bhd.